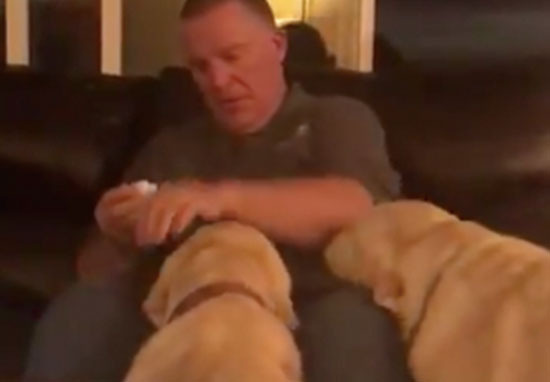 In a brilliant video, portraying all which is good and pure in the world, an adorable dog thinks he needs ear medicine because his sister does. The golden labrador, named Cache, waited patiently for his turn to get some of the treatment, which involved putting the medicine in the dogs’ ears and then rubbing them – possibly for medical reasons, possibly as a treat for being a good doggo. The video was shared on Twitter by Chloe Copley, and showed a man caring for one dog, then pretending to care for the other. The second dog still got his ears rubbed though, you’ll be glad to know. After the female Lab was taken care of she moved back, tail wagging, to make space for her brother, who obediently took his place in front of the man and sat down without even having to be asked. The man put the cap back on the medicine, a move that Cache was blissfully fooled by, and proceeded to follow his treatment routine. He added in some narration for good measure, making sure the dog was really convinced by the performance by saying ‘squirt squirt squirt’ as he held the medicine to the fluffy boy’s ears. As soon as he had been told the procedure was ‘all done!’ the good dog jumped up to go about his day with his “newly treated” ears. my dog has ear medicine she needs and the other one also thinks he needs it too.. nobody has the heart to tell him it’s pretend.. I definitely wouldn’t have the heart to tell him, especially after he sat so patiently to await his pretend medicine. 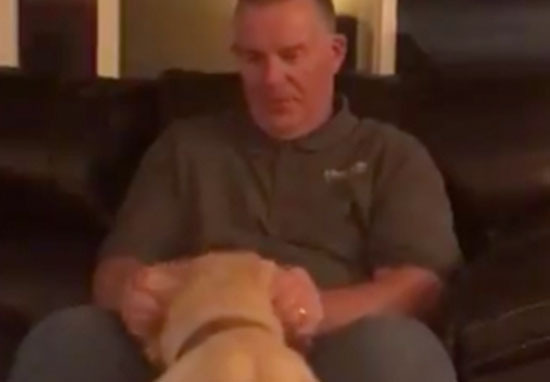 The video received over 10 million views and was retweeted over 300,000 times, gaining thousands of comments expressing love for the confused Lab. Labs are such wonderful beings..
What wonderful dogs. Obvious that they’re loved. And they return the favor. Nobody better ever tell him i swear to god. Look at that happiness omg. Cache received so much love that Chloe decided to share more videos of the adorable pupper in his day to day life. One of the videos showed Cache being a little more mischievous and taking his opportunity to stuff his mouth with toys when his sister wasn’t quick enough. Cache’s mischievousness has made me think; we all assume he’s the one being fooled, but maybe he’s actually just managed to convince the world of his ignorance, and is secretly aware that the medicine is fake, but keeps going back for those nice ear rubs. I wouldn’t blame him, to be honest. He’s too cute, he deserves all the scratches.